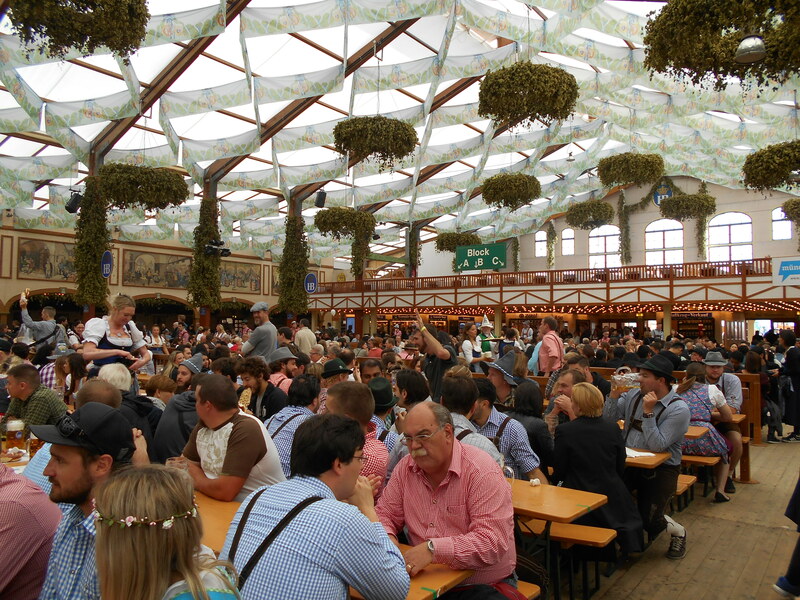 Several years ago, while I was on vacation in Munich, I got the opportunity to attend the city’s infamous Oktoberfest. The best way I can describe it is a county fair on steroids! There are amusement rides for the kids, booths selling all kinds of yummy foods and trinkets and, of course, the beer halls. These halls are enormous and can seat thousands of people. I had lunch in the hall sponsored by the Hofbräuhaus which is one of Munich’s oldest breweries. The place was decorated with hops from floor to ceiling. Beer flowed freely, the band played traditional German music, the food was incredible, and there was lots of singing and celebrating. Oktoberfest is a celebration of life in all its exuberance. It’s a time to give thanks and enjoy the company of family and friends. A German friend of mine remarked that Oktoberfest and the Christmas Markets are the two times of the year Germans give themselves permission to set aside the formalities of their culture and really let their hair down. Trust me, they know how to throw a party. No matter what culture we are a part of, there is something about this time of year that calls us to come together as a tribe and give thanks. Perhaps, it’s because in older times the harvest was mostly completed and the hard work of farming was coming to an end. It was a time to preserve and store food for the hard winter months ahead as well as give thanks to the Divine for the bounty of the land. Come, to God’s own temple, come, raise the song of harvest home. Harvest Home, which is also called the Ingathering, is a traditional English harvest festival that has been celebrated for thousands of years. Like Oktoberfest, it’s a time of singing, dancing and decorating the town with symbols of the harvest. My Wiccan friends call this festival Mabon which is named after the Welsh God, Mabon, the son of Earth Mother goddess Modron. They mark the holiday with feasting and enjoying seasonal foods like apples, pomegranates and root vegetables. From a spiritual perspective, Mabon is a time to reflect on the previous year, giving thanks for our successes (i.e. the things we have harvested) and assess which crops, projects, or dreams didn’t come to fruition. It’s a time to let go of that which no longer serves a useful purpose in our lives, so that we create space for something new to grow. There is tons of information available on the origins and celebration of Mabon, so I won’t repeat it here. What interests me the most is how the Fall Equinox calls us all to give thanks and celebrate, no matter what our culture or spiritual path. It’s one of the times of the year when nature’s message to us appears to be heard and received by all. This entry was posted in Mabon, Wheel of the Year and tagged Ingathering, Mabon, Oktoberfest. Bookmark the permalink.